Orange and green - the colour of autumn. My favourite season is winter. I don’t like the really hot weather. I dig rain and atmospheric conditions. It makes me feel more spiritual and melancholic, which is actually happy for deep people. 1. Red and blue look very nice together. Spring and autumn. Also summer and winter. I think I lean toward autumn, though; it's just magical. Lol don't worry about it, I've dominated the thread for long enough, it's about time somebody else had a turn. Summer, for sure. No school!!! Also no cold weather. I’d say my favorite season is late fall/ early winter. For some reason fall is just so pretty, and I don’t mind the weather. And I also think that red and yellow go together well, idk why. I love Spring. I feel like I'm coming alive again, right along with nature. I love the pastel colors all around. And I like the Easter bunny and Easter Eggs. I go to a bushland area for lunch. I always take one hour and just sit there on my own. It’s fantastic. It was a hot day today but during lunch it became overcast and windy, and it just rained tonight. Something to savour considering it’s summer. I'm happy when I'm happy. I'm happy when I'm spiritual and melancholy. I don't consider myself particularly 'deep'. I'm a Mediator (INFP-T). I had a Beatley moment when it asked "do you consider yourself a dreamer?" I think it has. Last time I took it I was INFP-A, but I took it just now and now I'm INTP-A. I've become a lot more logical/analytical of late, so that's kind of unsurprising. My inner Logician is compelled to add that I'm pretty sure most psychologists think the test is somewhat unscientific, to say the least. Like astrology, though, it's interesting nonetheless. I think it has. Last time I took it I was INFP-A, but I took it just now and now I'm INTP-A. Ahh, we almost matched. I took the test two (three? I don't remember) times with a decent amount of time in between and got the same thing every time. I've become a lot more logical/analytical of late, so that's kind of unsurprising. 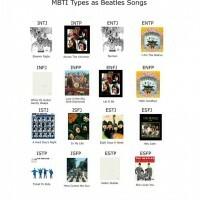 Last time I took it I was ISFP-T,now I'm INFP-T.
By the way,does anyone have an idea what types the fab four are? I am very much an ISTP. I have this saved to my phone and at times I read it to bring me back to some sense of understanding and acceptance. I can't express how much of a relieve it was to read this after wondering for so long why I was so messed up. I’m an INTJ. I’ve known this for many years. all I know is, I categorization everyone else as types of Beatles. i'm a john. I might take this test later, if I have time. Did they get your song right, @Timothy? Could we ask ourselves which one of these songs we want to be? Maybe your teacher would take an answer based on Myers-Briggs, @50yearslate.